I had this dream about Chris Dudley a couple nights ago. I presume I had this dream because I was thinking intently the day before what type of cupcakes I would make for my sweet friend Allison Hanna-Williams, whose birthday was Sunday. I can't help but associate Allison with basketball, even though she is a pro golfer these days! She is the friend I played basketball with for seven years, and hers is the father that I gave the 'I Love You' balloons to so many years ago, remember? First things first: I have immense respect and admiration for Chris Dudley. Chris Dudley was the first professional basketball player to play with Type I diabetes. He started the Chris Dudley Foundation to assist and help children with diabetes, and one of his projects with that foundation is a Basketball Camp for youth with diabetes held every summer in Vernonia, Oregon in early August. I attended this camp for 4 years straight and it was the highlight of my summers. Even though I was diabetic, I was very fond of believing that all "other" diabetics were totally weird. 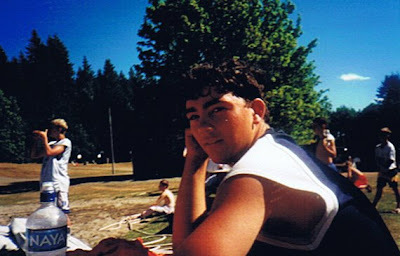 My first year at camp I met Justin Spring from North Bend, Oregon. He and I formed a close friendship that lasted for many years to come and helped me recognize that, okay, only some other diabetics were weird. One memory I have in particular was at breakfast, we were goofing off, probably flirting, and somehow we each ended up with an entire cube of butter lathered in each others hair, respectively. Very good times. I also have to give major props to the counselors at this camp. I loved every single one of them, and they changed my life. I can only hope to effect someone else's life, like they affected mine. Now that I've revealed this - one rule: No diabetes comments, chances are you don't know what you are talking about (and I mean that in the kindest way). Really,... none,... I mean it - ever. 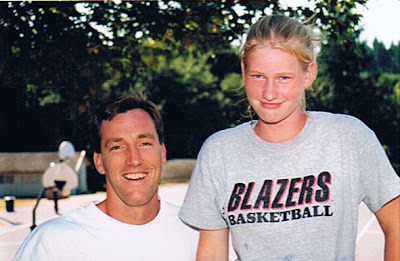 Chris Dudley came to camp every single day. He talked to us, played ball with us, and taught us about taking care of our diabetes, following our dreams, and living life well and responsibly. One day I remember sitting on the hill above the courts with Chris and a couple friends, chatting about back home, school, and diabetes, and in particular Chris was talking about his career and teaching us: "Do not take no for an answer." Then, in an innocent yet hilarious exchange, boy crazy 16 year old me, ended up asking Chris for his phone number. Interestingly enough in fact, I ran into Chris downtown a few weeks back. He was kind as ever, and he even remembered me! It was fun catching up! So you can see now how having a dream about Chris Dudley isn't that all that random. Well, like I said it was Allison's birthday, and seeing as she is a pro golfer I thought it was only apropos to make cupcakes on the green for her special day, plus she said she liked vanilla cupcakes, and she mentioned that her husband liked snickerdoodles. I could clearly see what I wanted in my mind, but I encountered two problems in the execution. The first was that I grossly underestimated the amount of time I needed for the details, and the second was that I didn't think through the requirements necessary for making the golf balls, which probably would have been easily remedied had I not grossly underestimated the time. So, needless to say, there is much to work on for the next venture in making On the Green cupCakes. All in all, I'm a new arrival on the fancy decorating scene. They tasted delicious though. I used Rose Levy Beranbaum's White Velvet Butter Cake recipe found on page 46-47 of "The Cake Bible", substituting the milk with half and half buttermilk, and adding a full 5 egg whites, and a simple buttercream frosting that I seem to always resort to: Butter, Cream Cheese, Powdered Sugar, Vanilla, Egg White, Vanilla Sugar - in any amount of porportions should work lovely! I made two very similar cupCakes. 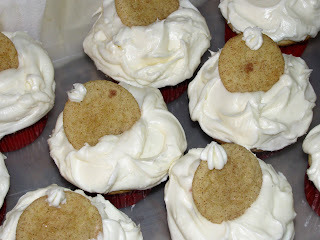 For her hubby I made a vanilla cinnamon sugar cupCake by tweaking just a few things. 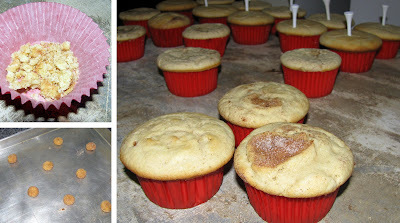 I started by making a batch of snickerdoodles, and crumbled 1/2 a cookie in the bottom of each cupCake liner. 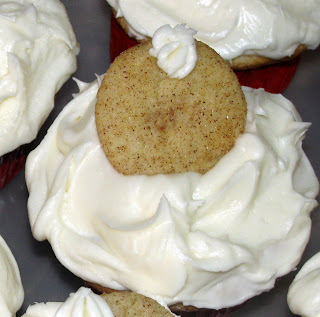 I then added the cake batter, and swirled throughout a teaspoon of cinnamon sugar. After frosting, I decorated the tops with a miniature cookie (.2o oz.)! 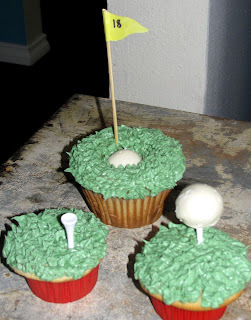 I baked the golf cupCakes according to the recipe, but tinted the frosting green. Along with my underestimation of time, I only had willow green dye - hardly the right color. I used actual tees, a skewer for the golf pin, and made golf balls out of vanilla cream fondant coated in white chocolate. I attempted to make golf dimples with the tip of my potato peeler, but it was long and tedious and often resulted in cracking the chocolate, so I gave up and decided next time - I need a mold. I was so late for the party it was an embarrassment, and so I hardly had time to worry about setting up a decent picture... not my best. Who'd'a thunk a golf ball could taste so good! you look so young in that picture! did allison like her cupcakes? i DIDN"T comment on this!? oh my gosh! honestly, i am in AWE with this post! oh my gosh catherine! WOWsER! you are awesome! seriously!!! seriously that was AMAZING! amazing! very VERY creative! they looked SOO divine! i want to eat all of them up!!!! oh my gosh!! !